Ask fellow campers about "Tiki Lagun Resort & Marina" and nearby attractions. Question: Has anyone stayed at the Tikki Lagoona Resort this year and what is your take on the place? Answer: Do Not do it!!!!!!!!!!!!!!!!! No,No,No, not for the traveler,only long term should stop here!!!!! Unlevel mud sites with poor 30 amp elec, terrible water, no cable or wifi. Hard to get to, hard to get a big rig in. Booked for 2 months over 4 months ahead, got there they had no record of me calling, gave me a 5 page application wanting more info than a bank loan requires. Paid for a week so we could regroup, even then they wanted insurance and registration!!! Park looked like most there had neither. Not a good place in anyway!!! We camped at Tiki Lagun Resort & Marina in a Motorhome. The park was a disaster, but found some fun with a few locals. Yongs Delta Tavern up the road has great food and drinks!!!! DO Not try to come in on Holt road, has a 13.5 high 9' wide "Subway" bridge on it, use Island Drive! McDonald road coming in, the only way in, could be the worst paved road I have ever been on. This place has a big sign that states it is under new management. I would not recommend it for anyone unless you enjoy the ambiance of a homeless encampment. 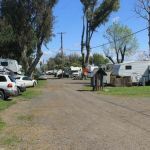 Most units here were permanent RVs, but it also included a bunch of semi-complete storage units, a shipment container and a few mobile homes. Lots of stuff at just about every site, a lot of run down units. Also, if you stay for longer than 30 days, you have to pay a security deposit (equal to one month's rent) which isn't returned to you unit 5-7 days after you leave (I guess they have to make sure you didn't ruin the carpeting or the walls or steal the site). Avoid this place unless you are desperate (and I was due to knee replacement - here two months). It's too bad their new management hasn't cleaned up the place. So far, all they've done is chop down a bunch of trees. The site is mostly dirt (mud after the rains this winter) with grass that is cut but not raked up. 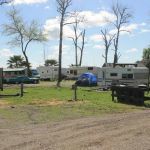 We camped at Tiki Lagun Resort & Marina in a Travel Trailer. The park is old but in good shape, they are really not set up for big rigs, we are 44 ft, the sites are around 30-40ft we pulled in facing the river so all the hook ups are backwards we did get 50 amps from the site next to us, but if they are full you may as well take a site not on the water. They are pet friendly and you have a lot of park to walk in. The park is about 5 min. from town in a car. No sewer available, they do provide a fair dump station. We camped at Tiki Lagun Resort & Marina in a Motorhome. What a dump! It may have been a nice campground at one time but not any more! It was quite run down. Overhead electric lines were so low that we could not stay there (thankfully!). Our rig would have hit them for sure had we tried to drive through the park. So we got our money back and had to make a U-turn at the entrance (that was fun!). We camped at Tiki Lagun Resort & Marina in a Motorhome. Not sure how this got a 9. All gravel, decent sites, but poorly marked. Restrooms and showers across the public road from the campground. No obvious place to discard of trash, no rules or anything included with the sketch of the campground. Cable TV was out, and WiFi was $9.95 for a night! Twelve miles from I-5 on the edge of a canal, not what we expected at all from a "Marina Resort" for $35 a night. At $25, as a "Campground" we might give another point or two. Also only honors one night of Happy Camper discount although the book doesn't mention this restriction. We camped at Tiki Lagun Resort & Marina in a Motorhome. This place was sharp. Stayed at Windmill Cove the night before and was incredibly disappointed. Moved over to Tiki and absolutely loved it. Incredibly friendly staff, restaurant on site, wifi available. Everything was clean and neat. We had a blast. We camped at Tiki Lagun Resort & Marina in a Motorhome. Are you affiliated with Tiki Lagun Resort & Marina ?